Now offering 0% Financing. Only $49.92/month! With the Janome 6100 computerized sewing machine you will get a top of the line sewing machine without having to pay top of the line price. The Janome 6100 computerized sewing machine offers all the luxury and features you associate with computerized sewing machines. 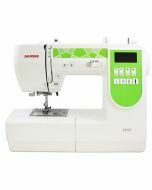 You will be amazed with the 100 perfectly crafted stitches, including 7 awesome buttonholes on the Janome 6100 computerized sewing machine! The Janome 6100 computerized sewing machine also features an LCD Screen with Direct Pattern Selection as well as Janome’s Superior Feed System, which offers the most stable feed of any machine available. This wonderful machine is perfect both for anyone who is looking to get into the fantastic world of sewing and quilting, or anyone seeking to enhance their journey. With the Janome 6100 computerized sewing machine you will have power, precision and convenience all at your fingertips!